Will you be officially tying the knot in 2019? Congratulations! Getting married is one of life’s most exciting adventures. With the wedding approaching, there’s likely a lot on your plate right now. There’s finding the venue for the reception. There’s choosing the wedding dress and planning the bridal shower. Then there’s mailing out the invitations, ordering the flowers, and booking the honeymoon. With everything there is to do, it’s easy to overlook the process of choosing the perfect wedding ring. But your wedding ring is an important detail you should put some time and thought into. After all, it will forever serve as a symbol of your marriage. If you’re wondering how to choose a wedding ring, never fear. Here are 7 ways to help you choose the perfect ring! The earlier you start envisioning your rings, the better. What do you envision the perfect wedding ring to look like? See where your visions align and differ from your partner’s. Should the wedding ring material resemble the engagement ring? Should the wedding rings look identical? Do you want a solid band or a band with an intricate design? Is there a custom design you envision for the rings? Many people don’t give much thought about wedding rings until they become engaged. If you’re not sure what you want in a ring, browse around. You can also find inspiration by talking to your married friends and looking at their rings. Talking about different types of wedding bands makes for a great start. But eventually, you and your partner will need to set a budget for the rings. Wedding rings can be a major expense depending on the style and material. Consultations with jewelers and retailers are other expenses to keep in mind. Even little details, like embellishments or stones, can add up. The timeline for wedding planning begins as soon as a person pops the question. When it comes to the wedding rings, you should order them no later than 6 weeks before the big day. It’s one less thing to worry about the sooner you order them. Before you start to really shop for rings, you should have a budget set. But browsing around can help you research prices and form a better idea for your budget. 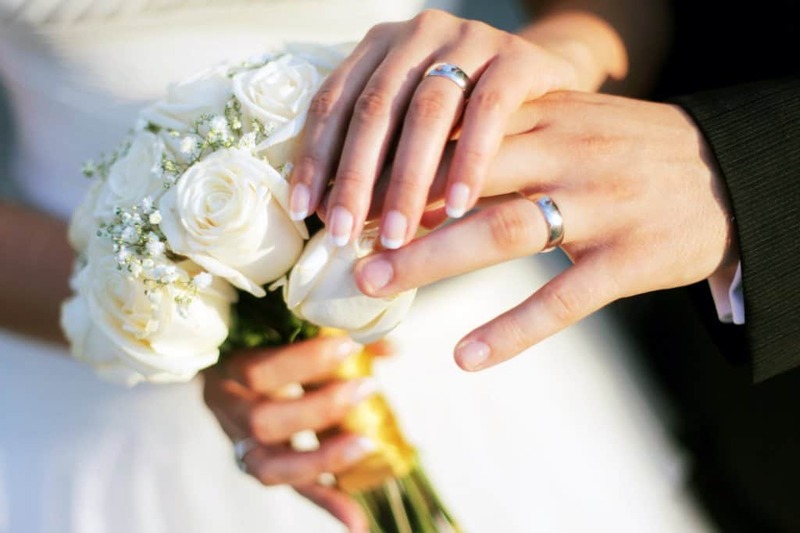 Browsing is also a great time to talk to jewelers about the different types of wedding bands. If you and your partner want custom rings, you should begin planning and browsing even sooner. Do you envision the quintessential wedding ring to be a solid band of gold? Or, do you believe a wedding ring should have diamonds encrusted on it? We all have our ideas of what the perfect wedding ring should look like. But it never hurts to try on rings that tread outside your personal taste. You may prefer a classic diamond for your wedding ring. But colored stones are trending for engagement rings and wedding bands alike. You may surprise yourself and wind up loving a beautiful topaz or sapphire instead. Try on different widths and styles. There are braided rings and blended metal bands, as well. Don’t set your heart on having matching rings, either. There is a way to have similar rings that show off your own personal flair. The material you choose for your wedding rings should complement your lifestyle. Some materials damage more easily. Other materials require more maintenance. For example, there are noticeable differences between gold and white gold. White gold contains nickel and is more durable and easier to maintain than real gold. If you use your hands a lot, you may want to opt for a sturdier solid band. A ring with embellishments or stones can trap more dirt. You’ll be wearing your wedding ring for years to come. While a ring style may be trendy now, it may not suit you when you’re older. Opting for a timeless, simple ring is always a safe route to take. Once you and your partner decide on a pair of rings, it’s time to get the sizing down right. Your jeweler or retailer will help you with this. But there are some ring fitting tips to keep in mind before your final consultation. 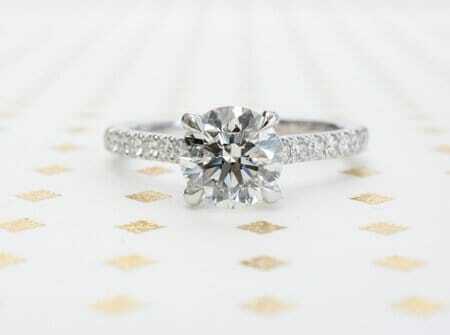 Your ring should slide on your finger with ease. But you should have to pull a little to remove it. Before the final fitting, make sure your hands are at room temperature. Cold temperatures can make your fingers shrink slightly. Hotter temperatures will cause them to swell. Ring shopping shouldn’t feel arduous and stressful. This is a wonderful opportunity to bond with your soon-to-be husband or wife. So, set a day aside for ring shopping when you both can relax and enjoy the day. Try not to make the day all about wedding planning. You’ll have a better time browsing and shopping when you’re not stressed. Go out to lunch or for coffee after browsing. Make it a fun day and go see a movie or do something you both enjoy. Once you’re married and the reception closes, life with your new husband or wife will commence. Of course, you’ll have photographs and memories to remember the special day by. But the ring on your finger will always carry the most meaning. If you’re wondering how to choose a wedding ring, these 7 tips make for a great foundation. But you may be looking to make your wedding rings all the more special. Custom wedding rings can make for the perfect symbol of your love. Are you looking for the perfect wedding ring in Toronto? Learn more about custom wedding rings today!